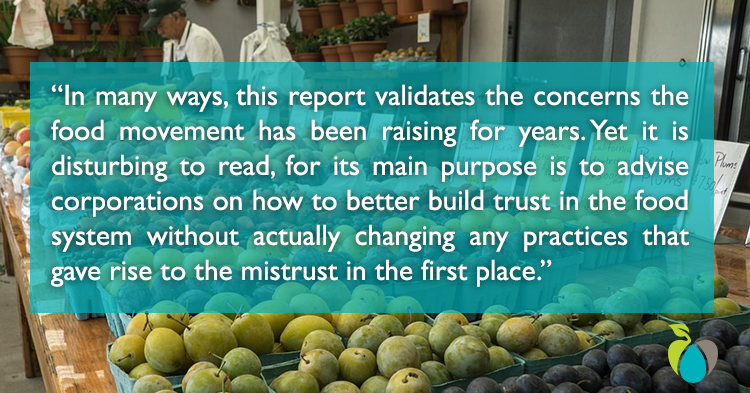 New report aims to advise corporations on how to better build trust in the food system without actually changing any practices that gave rise to the mistrust in the first place. A report released at the end of May found that a majority of Canadians do not think our food system is moving in the right direction -- an assessment Food Secure Canada heartily agrees with. But exactly what needs to be done to create a food system we are proud of is highly contentious. Does our food system need to change (we think it does) or are Canadians misled and wrong to be concerned (as the report asserts)? This is a critical matter for public debate as Canada prepares to develop its first national food policy: who can we trust. Different organizations are weighing in. The Canadian Agricultural Policy Institute held a forum on the issue last November. The Canadian Federation of Agriculture has done work on social license. The new Centre for Food Integrity and Farm and Food Care Canada recently organized a Public Trust Summit in Ottawa. The Canadian Centre for Food Integrity is an offshoot of its US counterpart, described by Sourcewatch as an “industry front group” and includes McDonalds, Monsanto and DuPont amongst its backers. Ironically, the source of a report on public trust cannot actually be trusted. 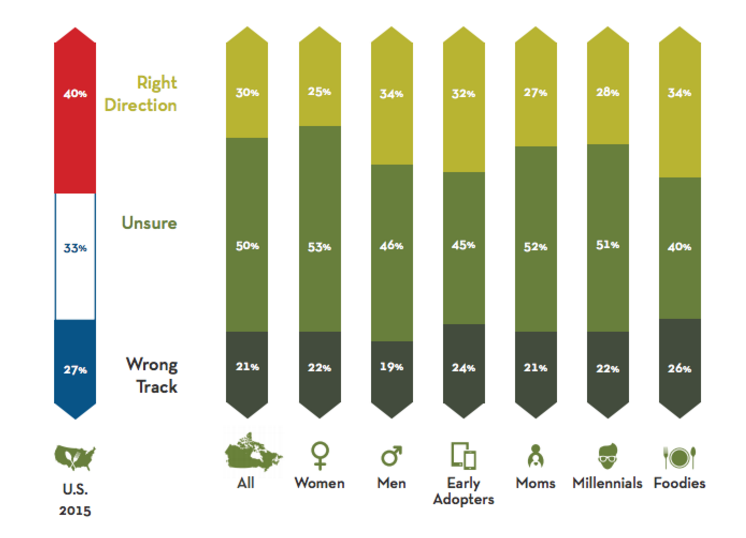 The report’s public opinion summary highlights that mistrust is particularly marked for moms, Millennials and foodies. 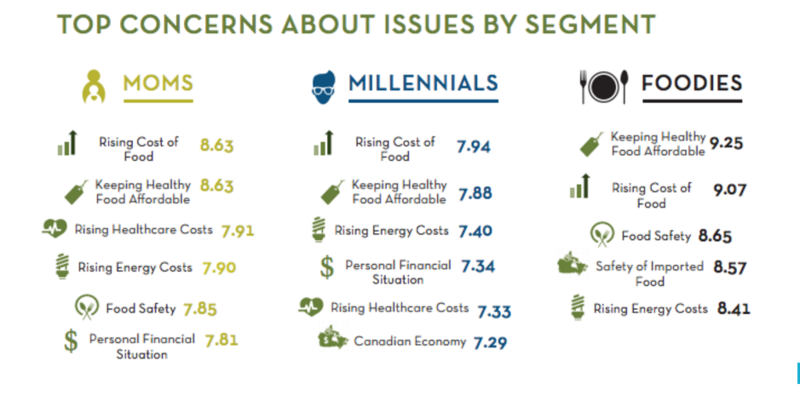 It pays close attention to these three audiences as less than a third of them believe that the food system is “moving in the right direction.” The rising cost of food and the affordability of healthy food were rated as issues more concerning even than the cost of health care or general concerns about the economy (the report omits that the rising cost of health care is intimately related to diet-related chronic disease, but that is another article…). While the cost of food is underlined as a growing concern, there are many other aspects of our food system that concern consumers, including animal welfare, pesticide use and genetically modified crops. In fact, over 40 per cent of respondents were concerned about these issues. On most issues, women were more concerned than men. 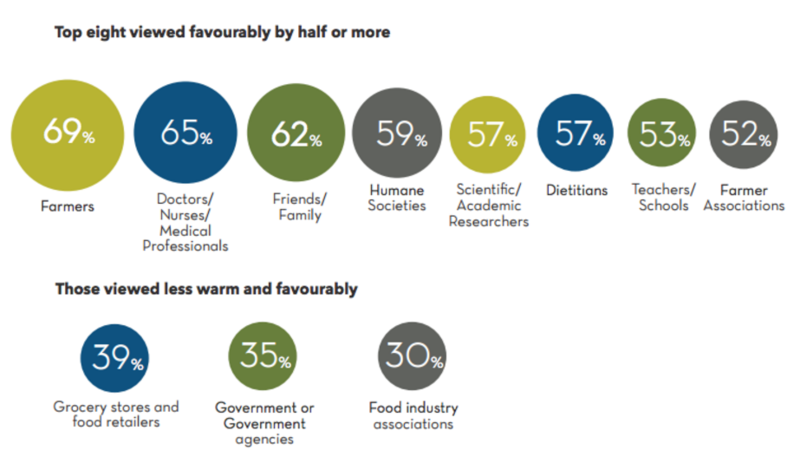 Notably, Canadians trust individual farmers much more than they trust either industry associations or government. 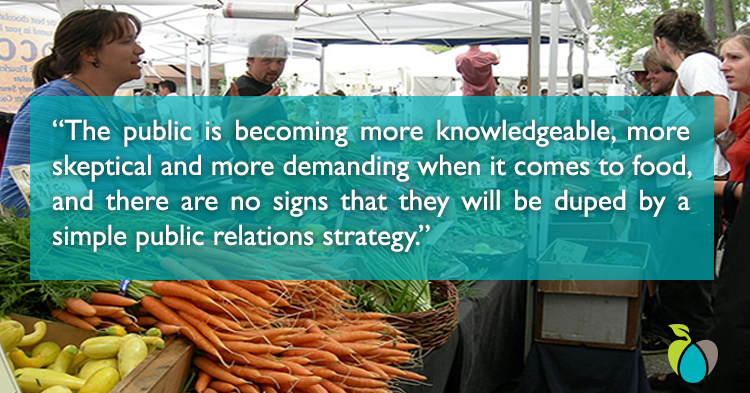 In many ways, this report validates the concerns the food movement has been raising for years. Yet it is disturbing to read, for its main purpose is to advise corporations on how to better build trust in the food system without actually changing any practices that gave rise to the mistrust in the first place. This sounds like Big Food going on a Public Relations offensive, more than like a legitimate piece of research trying to understand what has caused the breakdown in trust. The public is becoming more knowledgeable, more skeptical and more demanding when it comes to food, and there are no signs that they will be duped by a simple PR strategy. 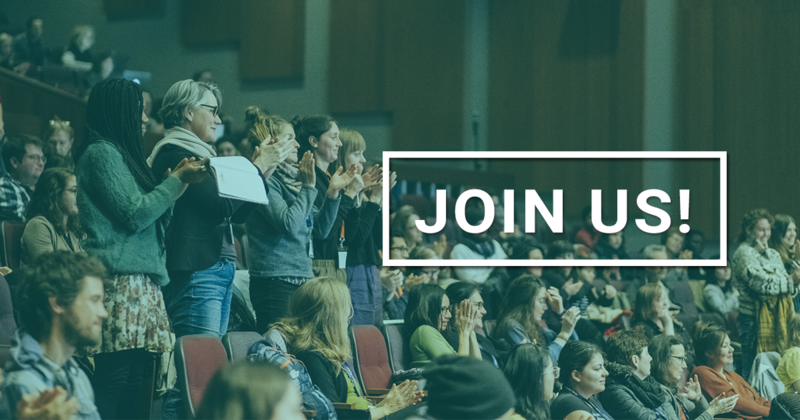 As we begin to elaborate a new food policy for Canada, public dollars would be well spent finding out more about what concerns Canadians about their food system and releasing the complete findings (as is usually done with public research). Then the government can sit down down with all stakeholders, not just industry, to see how those concerns, and others that the public may not know about, can be addressed. Canadians don’t want merely to buy from companies who appear to share their values; they want to buy from companies who are putting those values into practice in how they treat people, animals and the environment. And they expect the government to adopt policies, programs and regulations that will ensure their values are being respected. 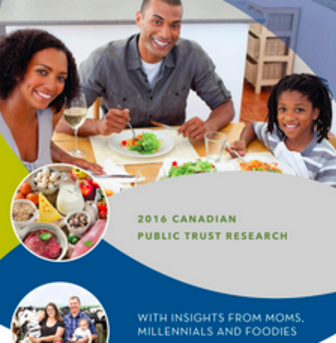 June 2016 - The new Canadian Public Trust research highlights the rising cost of food and access to healthy affordable food as two top concerns for Canadians, above concerns for health care or the economy.